Once again, these photos are from the Newcastle City Libraries Archives. They are pre delivery publicity shots of FVK 109, a 1937 Guy BTX, and were taken at the Northern Coachbuilders works which was located on Claremont Road Newcastle, my records suggest that the vehicle may have been a one off. Between 1936 & 38, Newcastle Corporation took delivery of 70 Trolleybuses, this took the fleet numbers from 40 to 109. They were an assorted mixture, 40 to 43 were two axle Karrier E4 with H56R MCCW bodies, the remainder were all three axle types with H33/27D bodies, 17 AEC 664T – 24 Guy BTX and 24 Karrier E6A. 44 to 77 and 85 to 108 were MCCW, 78 to 84 were Roe, that brings us back to 109. However, the next vehicle I have records for is 112, a 1938 Daimler with H33/27D MCCW body, it carried a Coventry registration, DHP 112, and was the only Daimler in Newcastle’s not inconsiderable fleet, which would suggest that it was originally a demonstrator. If they ever existed, I have failed to find any records for fleet numbers 110 and 111, so perhaps 109 was actually one of three. Changing the tack slightly, I don’t understand the thinking behind this style of body, two axle trolleybuses had a capacity of 56, but despite the extra length these were only 60, with most of the extra space taken up by a second set of stairs, and a door at the front, it seems an awful lot of expense for the sake of an extra four seats, post war vehicles had what I suppose would be called a normal configuration with an open platform and one set of stairs, which gave a capacity of 70. Handsome and fascinating vehicle. Unusual that the staircase evidently eats up one seat downstairs, Roe fashion, yet—to go by the position of the handrail seen through the back window—also extends some way across the back of the platform in conventional staircase fashion, suggesting that the platform is shorter from front to back—something also suggested by the smallish rearmost side windows upstairs. The front upstairs bay is also unusually long, yet there’s nothing unbalanced about the whole design, at least to my eye. If only one had survived! Seeing one after another of Ronnie’s posts fills me with envy: what a wonderful variety of characterful vehicles, some run by quite small authorities, bearing bold liveries and stylish lettering, all exuding a real sense of local pride. Newcastle’s pre-war trolleybus fleet was entirely six-wheeled vehicles, ALL with the same basic body design, incorporating two staircases, a front exit with doors and sixty seats. This arrangement was adopted because front exits on trams had been the norm for many years in Newcastle and the trolleybus routes were initially all for tram replacement. The layout was similar to that adopted by Bournemouth Corporation for its trolleys. It may just be coincidence but Newcastle’s livery was also very close to that operator’s, albeit with a much darker shade of yellow as per the cadmium used on the trams. Newcastle’s initial 1935 trolleybus fleet was numbered 10-40, extending by 1940 as the network developed to no. 124. As Ronnie rightly states the numbers 110 and 111 were never used, for reasons unknown. Noel Hanson in his excellent history of Newcastle’s trolleybuses offers two theories. One is that 112, a Daimler demonstrator, was coincidentally registered in Coventry as DHP 112 and so NCT thought it prudent to skip from 109 to 112 to keep registration and panel numbers aligned. OR, the reason was an ‘accounting’ allocation of 110 and 111 by Newcastle to other demonstrators that had been borrowed in 1937/38… Whether they actually asked Daimler for a ‘112’ registration on their demonstrator may never be known! 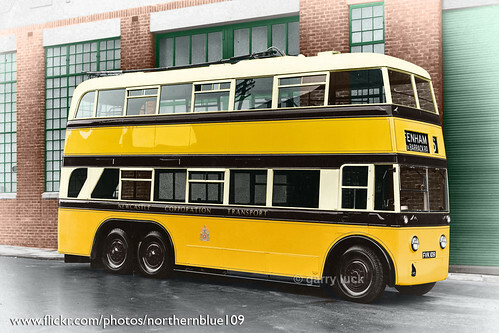 Incidentally 109 saw the light of day as a chassis-only exhibit at the 1937 motor show, then being purchased by Newcastle who had it bodied during 1938 to its ‘standard’ trolleybus design by local firm Northern Coach Builders. Although about this time NCB were bodying Daimler COG5 double-deckers for the Corporation, 109 remained the only pre-war trolleybus bodied by NCB – quite different from the post-war trolleybus fleet in which NCB bodied 80 out of 186 vehicles. In the pre-war fleet of 113 pretty well externally identical vehicles, no fewer than four chassis makes (27 AEC 664T, 50 Karrier E6/E6A, 35 Guy BTX and 1 Daimler CTM6) and five bodywork manufacturers (5 English Electric, 5 Brush, 89 MCCW, 13 C H Roe and 1 NCB) were represented. Some kind of record? Looks like Metro-Cammell were very much in favour, again reflecting purchases of motor buses at this time. Eight of these splendid AEC Regent III were among the 1949 intake. By 1951, the size of the name had been considerably reduced; this would also be around the time these were due for their first repaint, so my guess would be that the photo was taken roughly 1950 or thereabouts. As things turned out, they would be the last new AEC double deckers to enter service at Percy Main, with the next four intakes all being Guy Arabs, although AEC remained the preferred choice for single deck vehicles and coaches. After the intake at the beginning of 1940, no new vehicles were allocated to Percy Main until 1946. During the war several vehicles were requisitioned by the Ministry of Transport or transferred to other depots within the NGT group, to make matters worse, the bodies on all the NGT group forward entrance Short Brothers AEC Regent I’s, had developed serious structural faults at the leading edge of the doors, by 1943, they had deteriorated to such an extent that special permission was granted to have them rebodied, presumably as utilities. Northern Coachbuilders carried out the work at their Cramlington works. The H26/24R Short Bros and H28/24R Brush bodied AEC Regent I’s from 1931 and 1932 seem to have lasted somewhat better, they were rebodied in 1945. They were also done by NCB, but at Claremont Road in Newcastle. Once rebodied 42 – 51 – 79/80/81 & 89 all returned to Percy Main, the remainder were reallocated to other depots and renamed and numbered, but retained their original registrations. The years between 1946 and 1949 saw a frenzy of activity, with no less than 52 new vehicles arriving at Percy Main, bear in mind that the total fleet was around 120 vehicles, of which about 18 were coaches. 1946 – 123/127 – FT 5623/5627 – H56R Northern Counties Guy Arab II G5LW. 1947 – 128/142 – FT 5698/5712 – H30/26R Weymann AEC Regent II – 141/142 carried the Wakefields name. 1948 – 143/156 – FT 6143/6156 – H30/26R Weymann AEC Regent II – 155/156 carried the Wakefields name. 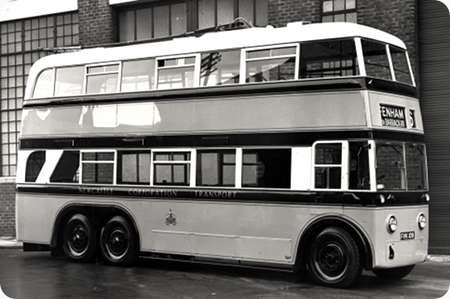 1949 – 157/164 – FT 6557/6564 – H30/26R Northern Coachbuilders AEC Regent III – 157/158 carried the Wakefields name. 165/174 – FT 6565/6574 – H30/26R Pickering Guy Arab II. 93/95 – FT 4220/4222 – 1938 H26/26F Weymann AEC Regent I – Rebodied by Pickering as H30/26R: 1957 sold to Provincial as replacements for vehicles destroyed in garage fire, finally withdrawn 1964. 96/103; FT 4496/4503: 1938 H26/26F Weymann Leyland TD5 – Rebodied H30/26R Northern Coachbuilders MK 3. 1939 – 111/112 – FT 4941/4942 / 1940 – 114 – FT 5224 – 117/118; FT 5227/5228 – 119/120; FT 5262/5263 – All B38F Brush AEC Regal – Rebodied B38F Pickering. I think this looks a very handsome vehicle, Ronnie. These NCB bodies always remind me very much – if you cover up the very obviously different front ends – to the Park Royal-bodied Regent III’s of my local operator Halifax Corporation/JOC. Bradford had some very similar to these, and Huddersfield JOC had some lowbridge ones. They appeared to develop quite a degree of body sag though and pictures of many of them a few years on show a distinct downward curve in the waistrail (I know how they must have felt!). A nice straight forward, yet cheerful livery and an impressive gold shaded fleetname. Looks just right. Sheffield had quite a number of these NCB bodies – 10 each on Daimler CVD6 and Crossley DD42 chassis and 2 lots of 10 on AEC Regent III chassis. The final 10 were of a slightly more modern appearance, and I thought they were rather handsome. I agree with you entirely, John, about the Halifax Park Royals – but I actually think the front has an echo of the classical Weymann front. They were, however, as you say, quite dire, with their pronounced body sag which I assume was for the usual reason of unseasoned timber – being all they could get, even in the early post-war period. The first lot of Regents were included in the green repaint experiments – which was an unmitigated disaster. One assumes that the quality of the timber had improved by the time of the Newcastle "ECW clones". NCB closed shortly after but Roe’s bought all the machinery AND the timber from the receivers. Mention of the AEC Regent III /NCBs for Bradford Corporation (524 – 543; 1947/48) by John has made me think there were several variants of the AEC Regent III. Bradford specified the 9.6 litre engine and the pre-selector transmission, whilst some BET Companies preferred the 7.7 litre engine and the crash gearbox. What was the specification Ronnie of the Tynemouth and District AEC Regent III posted above? 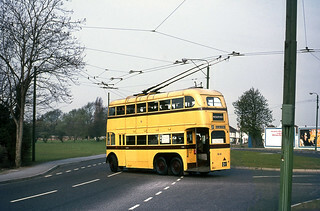 When new these buses were splendid sight as shown above and the body fitted well on many other similar types of chassis such as the Leyland PD, Daimler CV and Guy Arab III. They were 7.7 with a crash box, Richard. So far as I am aware, the NGT group never had any pre select half cabs, there were certainly none at Percy Main, and the only semi auto half cabs were the Routemasters. Newcastle Corporation had some very similar NCB bodied Regent III, although they were slightly different under the windscreen, I think they were pre select. 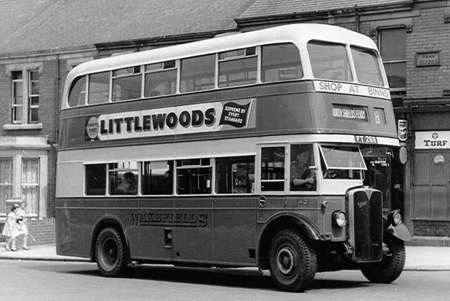 Obviously they were double fronted, but they also had 4 and 6 wheel trolleybuses with this style of body (501 is in preservation) As I remember, these and the Newcastle Regents were outlasted by the Weymann bodied Regent 11 from 1947 and 1948, perhaps they developed the body sag problems mentioned. SDO had some Regent III with ROE bodies, they were later transferred to Northern, and lasted until about 1965 or so. 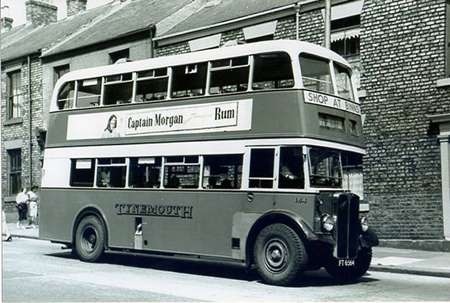 ‘Bus Lists on the Web’ shows the Tynemouth and District Regent IIIs as type 9612A, which, if correct, gives them 9.6 litre engines and crash gearboxes. I stand corrected, Peter. The 1947/48 Regent II were 7.7, and most of the 1949 Pickering bodied Guy Arab III, which came with Meadows engines were later converted to AEC 7.7, but these may well have been 9.6 units, so perhaps spares may have been another reason why they were withdrawn before the Regent II and the Guy’s. Featured elsewhere on this site is a posting of a 1931 Short Bros bodied AEC Regent of Portsmouth Corporation. Between 1931/2 Percy Main depot took delivery of 16 virtually identical vehicles, I cant be absolutely certain about the fleet or registration numbers, but my information suggests they came in two batches of eight, and were FT 2516/23 – 34/41 in 1931; and FT 2611/18 – 42/9 in 1932: In 1940, three of them, 39/41 were transferred to Northern. All 16 were rebodied by Northern Coachbuilders, the first was 49, that was during the war years and it received a utility body, it too was also transferred, but the remainder were done in 1945, and all as seen here. All the vehicles that remained at Percy Main retained their original fleet numbers, four of them, 42/5, carried the Wakefields name, but that apart they were all identical. These bodies were notorious for sagging (green wood in the frames) but this one looks smart – probably photographed when the body was new. Is that a retro-fitted post-war radiator? Looks a little long – certainly compared with Sheffield’s 1952 rebuilds of 1938/9 Regent I chassis which retained the original (short) radiators. The high gloss and standard of finish of this very attractive body suggests at least a repaint and possibly an overhaul, hence no sag! I notice it’s been given the later, longer, AEC rad, which always improved the frontal appearance. You mention the high gloss, Chris, even as late as 1967, when I first started at Percy Main, all vehicles were repainted every three years, they were hand painted, and the process was five coats, the last one being a clear varnish. But ‘here we go again’ that was pre NBC, and all the NGT group companies had a pride in their fleets, as did the vast majority of operators at the time. There was some discussion on the SCT site a while ago about the NGT pre-war SOS which was rebodied with this style of NCB body in 1945. Noting that Ronnie states that these AEC’s were also rebodied in 1945 and taking that date to be correct, would that make NCB the first British coachbuilder to produce bodywork to full peacetime standards after WW2? I can’t help noticing that, disregarding the front end, the rest of this bus looks remarkably similar to Halifax Corporation/JOC’s Park Royal-bodied Regents of 1947-50. These were based on Park Royal’s wartime utility design with a prewar-style rear dome and the frontal profile modified to resemble the current postwar metal-framed design. As I understand it, Park Royal were responsible for designing the original utility double-deck body for the MoS which other manufacturers then put their own interpretation on. NCB did build some utilities, so I wonder if these and their early postwar bodies were based on the Park Royal utility design. Thanks for offering this, Ronnie. Another gem from your collection. So far as pride in the fleet is concerned, it does seem to have carried forward into what is now the Go Ahead Group, if my experiences with Brighton & Hove, Oxford, and the "Go South Coast" members (Solent Blue Line, Southern Vectis and Wilts & Dorset) are any guide. The punters notice such things, too, with the local member of that group based in Aberdeen getting a far less favourable press than GA. Interesting to see such a modern-looking body on a chassis with semi-floating rear axle. The short bay ahead of the platform intrigues me too: did the chassis have the older 15′ 6½" wheelbase? A standard postwar NCB body would have been designed around a roughly 16′ 3" wheelbase, so this one would have needed adapting. Whatever the structural problems may have been, I still find these bodies very good-looking. 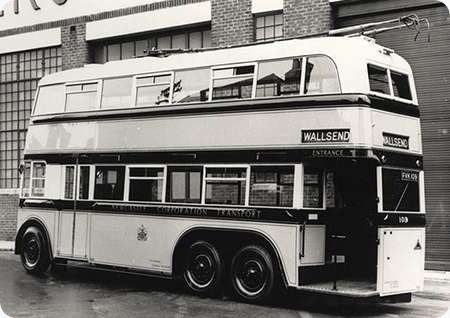 I submitted some thoughts too this Old Bus website in 2012 on post-war NCB design relating to the Bradford Corporation re-bodied AEC 661T trolleybuses 597 to 632 series from 1946 through to 1949 and resubmit my views to this debate. These views can be found on the OB site under Newcastle Corporation – Daimler.